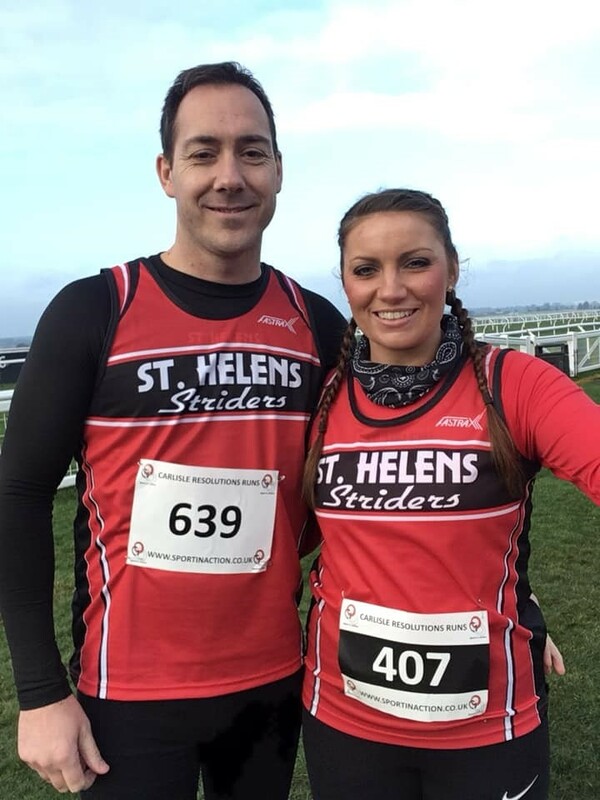 A band of St. Helens Striders converged on Cheshire to take on the Helsby Half Marathon . Martin Ballard and Chris Reid led the way, clocking new course PBs in identical times of 1:34. Leslie and Alex Abbott were next home in 1.46 and 1.50 respectively. Jo Keogh, Pete Medlicott and Katie Taggart completed the Striders contingent with strong performances. New recruits Andy and Gerry Shaw certainly proved resolute at the Carlisle Resolution 10k. Andy earned the domestic bragging rights, finishing in an impressive 48:20. His devoted wife Gerry was hot on his heels, however, following close behind in 50:27. An impressive Striders debut for the dynamic duo. The hills were calling for a daring trio of Striders. At the Coed-y-Brenin Half Marathon in Wales, Joe Weaver (1.49) and Tom Chadwick (1.58) negotiated the tricky trails and over 2000ft of ascent to conquer the 13.1 miles in hugely impressive fashion. Closer to home, Eric Ranson took on the 10k Mast Race, a gruelling slog to the summit of Bolton’s Winter Hill. Eric performed admirably, earning a top 40 finish in a superb time of 48:53 .